Changes coming to "Star Wars Weekends" at Disney's Hollywood Studios. Good news for Star Wars Fans and Folks who attend the highly popular "Star Wars Weekends" event at Disney's Hollywood Studios theme park in Orlando, Florida. 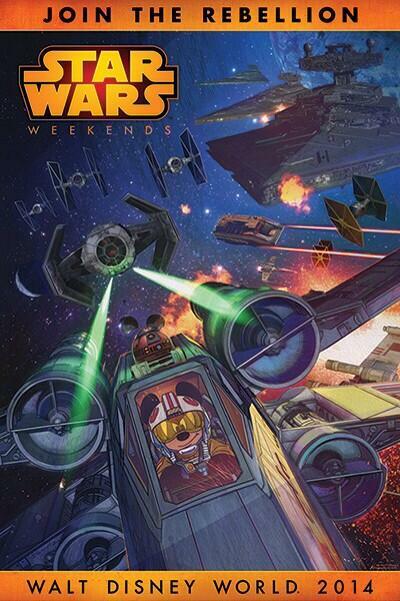 Star Wars Weekends will now run nearly full month, four complete weekends for the 2014 season. Starting on May 16th and ending on June 15th the event runs Friday, Saturday and Sundays. The event is also getting a new upgrades for the 2014 season in addition to the extra time length but it comes with a cost. Symphony of the Stars- A New "Star Wars" themed firewooks show will be added to the parks schedule. The price you pay? "Hyperspace Hoolpa" is gone. Fans believe this move comes in light of the new movies hitting the theaters shortly, that Disney is now trying to reign in the "silly" part of Star Wars and force the series into more serious notes with both fans and newcomers to the genre. Many seem to believe this may also be part of the new "Star Wars Land" which is confirmed but still a great rumor among fans.